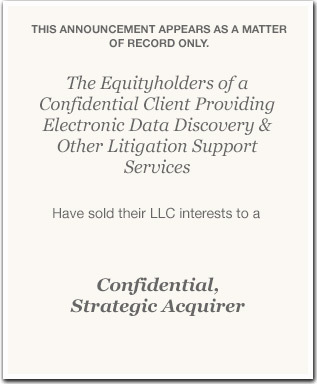 Serial entrepreneur/owner who founded a full-service litigation support services company providing services to law firms and large corporations was seeking 100% liquidity for his efforts in building a highly profitable business in a major legal market. The owner was in the process of opening a second litigation support services office, as a separate legal entity, in another major metropolitan market and shared his objective to build and ultimately sell the second office in the future. While the owner felt it was an opportune time to sell his main operation, he wanted a few years to build his new operation before selling it so that he could capture full value for his efforts as he realized there was little value attached to a start-up operation. The challenge for the De NES Partners principal was (i) convincing potential acquirers to structure a deal to acquire the main operation while (ii) allowing the owner to delay the sale of the new office; and (iii) ensuring that the owner, who was a key component of the Company’s success, had an economic incentive to ensure the continued success of both offices that would satisfy both buyer and seller. A key issue in this arrangement was determining a fair revenue split of new business and shared costs between the offices to avoid a conflict of interest for either party. The De NES principal was successful in eliciting a number of formal offers from strategic (industry) and private equity buyers willing to provide competitive transaction consideration for the initial office; however, none of the buyers in their initial set of offers was willing to consider assigning any current value to the second entity since zero economic value had been created to-date. After subsequent discussions, one of the interested buyers that was keenly aware of the company’s sterling reputation and solid client list indicated they would agree to purchase the start-up entity at a mutually agreeable future date if both parties could develop a mutually beneficial operating services agreement detailing how revenue and costs could be split fairly between the two entities, ensuring that the economic interests of both parties could be protected. The De NES principal was then able to negotiate a deal framework that ensured the financial and operational commitment of the owner going forward, thus satisfying the buyer, while obtaining a structure that allows the owner to maximize his potential sale proceeds. As part of the final deal, the buyer purchased the initial entity at closing, and is obligated to purchase the second entity at a pre-determined multiple and at a pre-determined, future date, which allows our client to focus solely on growth in the interim to maximize total transaction value. The transaction provides the sellers’ management team security in the form of multi-year employment agreements and provides a defined exit strategy to the owner. Copyright © 2019 De NES Partners, LLC. De NES Partners is a separate entity from BA Securities, LLC. De NES Partners and BA Securities, LLC are not affiliated entities.